Yesterday we launched Doshi Risington, a landmark project in more ways than one. With sweeping views of a reserve forest and located bang in the middle of central OMR, it is close to work, health and education with peace and tranquility to kick back and relax. But more importantly we launched at a breakthrough price. One which is impossible for the competition to match. We expected our customers to scream Oh My God, This is Amazing ! and they did. Oh My God! we cannot match this location and price, What will we do? 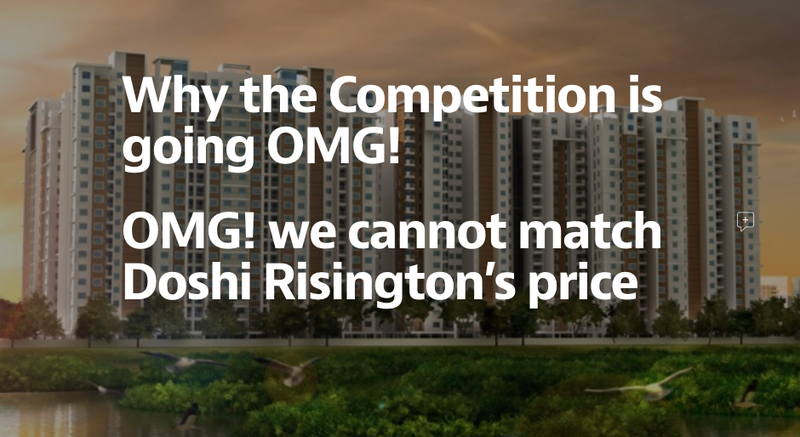 We welcome competition especially because we know Doshi Risington is better than anything else out there. How is it better? Doshi Risington is bang on Old Mahabalipuram Road in Karapakkam in Central OMR. Competition is not only in localities far away from Karapakkam but also not on OMR. In roads tucked away in small narrow lanes. Should they even compare themselves to Risington, when they are not even on OMR? Doshi Risington has 50+ amenities which cannot be compared to the competition, In fact some of their projects do not even have a swimming pool! Doshi Risington true to its name has high end specifications like wooden flooring, Roca sanitary ware, Table Top wash basins, Jaquar CP Fittings, Shower Panels, Polished Designer Doors, Renova Texture Paint for exteriors. Competetion has boring standard specifications. Doshi Risington’s location and price combo cannot be matched. In fact the only project cheaper than Risington is so far away from the city, it should not be called a home. It should be called a holiday home! That is why it is called “Risington” because it rises over and above any competition.